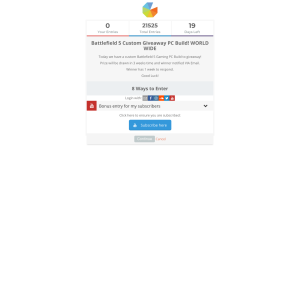 Today we have a custom Battlefield 5 Gaming PC Build to giveaway! Prize will be drawn in 3 weeks time and winner notified VIA Email. Winner has 1 week to respond. Winner will be randomly drawn and notified by email. PC will be packed sufficiently and if any damage may occur during shipping it is not replaceable. Winner has 1 week to reply.